Today’s post is part of the Maritime Sunday series. 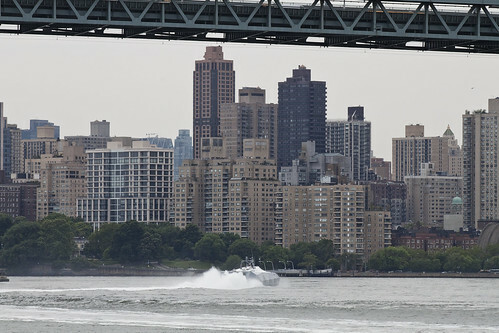 That’s when the NYC DEP Skimmer boat “Jamaica Bay” appeared. SV Jamaica Bay was new in 2005, Its service area is reported tersely as “Tributaries,” it is 50 feet long, and can carry a capacity of 3,000 -12,000 lbs of wet material. Floatable debris consists of a wide assortment of plastic, wood, paper, glass, rubber, metal and organic waste materials that float or are suspended in the water column and may eventually be deposited on shorelines and beaches. Floatable debris originating from street litter, combined sewer overflow (CSO) discharges, storm water discharges, decaying shoreline structures, pleasure boaters, and littering beach goers, can harm the marine environment and cause area beaches to close. For the benefit of those of you who don’t spend all of your time puzzling out the make and model of things which randomly navigate past you, a “skimmer” is a kind of work boat which travels along and scoops up “floatables.” This can mean anything from tree limbs to trash, and the NYC DEP operates just one several of skimmer fleets on the harbor. NJDEP and US Army Corps of Engineers also perform this task. The gizmo at the front of the thing opens up and forms a boom, and onboard conveyor systems draw flotsam and jetsam out of the water column and into a bin. 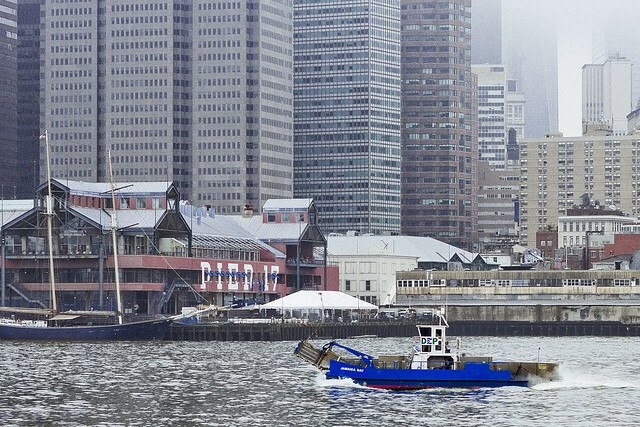 Skimmer boat “Jamaica Bay” is one of several “small” skimmers operated by DEP, and the big one is called “Cormorant.” One thing about which jumps at me whenever I look at the NYC DEP… as a department… is just how GIGANTIC it is. A hearty maritime Sunday shout goes out to the Captain and crew of SV Jamaica Bay. Inspirado strikes in funny ways. To wit, Our Lady of the pentacle returned from one of her periodic expeditions to area thrift and secondhand stores with a used Viewmaster and several of the little travelogue reels which typified the gadget (The Petrified Forest, or Alcatraz, or Grand Canyon- there were thousands of these things, and it was a very popular diversion in the pre digital days). For those of you born into the digital age, a viewmaster was a “toy” featuring a binocular sighting gizmo that focuses in on a tiny transparency contained on a ratcheted disc which is rotated into position via a lever. The whole device is held in front of an illuminated light source, and whatever the presented image is appears in the sights. The Viewmaster people perfected the trick of a certain dimensionality, not true 3d of course, but the sort of analog stereoscopic illusion which you might be familiar with because of Disney animation with it’s multi plane camera work. This effect is something I had forgotten about, wherein comes the “inspirado”. There’s got to be a way to suggest that dimensionality, the “jump” as it were, in photoshop. Not quite as simple as “tilt-shifting“, the effect I’m trying to get (which I haven’t yet achieved, although these 2 images are fairly close) involves stacking the various layers of background with certain alterations to density and saturation. That “pop” isn’t quite there yet, which might represent a shortcoming in the actual photograph of course, but it’s fairly close. Of course, there are those who do actual stereographs- YTF from the Newtown Pentacle group at Flickr has mastered the technique for instance- but I’m trying to achieve it in a single image. Social gatherings and year end meetings consume the evening hours of twilit December, and recently, I had occasion to be at the Pier 17 complex at South Street Seaport. Upon arriving at my destination in the cavernous building, this scene greeted me. Luckily, I had my trusty “old” camera- the Canon G10 with its magnetic tripod gadget attached which allows me to make “on the fly” long exposures. Even so, this was a lucky shot. 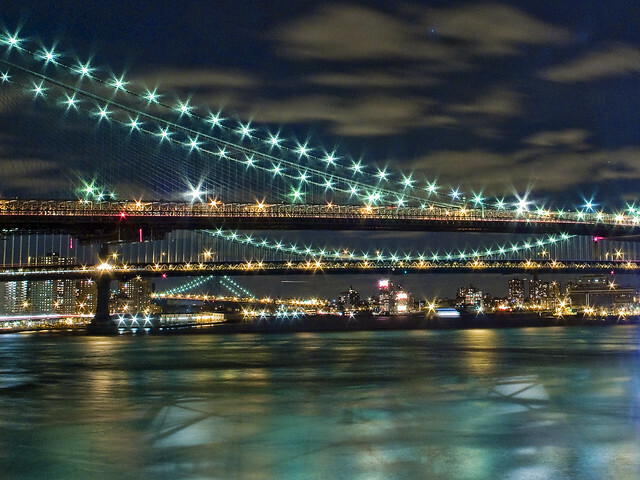 A 15 second exposure, looking north along the East River at the Brooklyn, Manhattan, and Williamsburg Bridges, on December 7th, 2010 at 7:50 PM. Gaze upon it, lords and ladies, a risible talisman of permanence amidst an ever changing industrial landscape… The Hunters Point Avenue Bridge. A recent post was offered for consideration at this, your Newtown Pentacle, which hinted at certain remarkable events about to occur in its environs and discussed a small part of the rather expansive history of this largish bit of motile steel which spans Dutch Kills. Glory then, in the announcement of a free walking tour celebrating its centennial. The New York City Bridge Centennial Commission (NYC BCC) and Newtown Creek Alliance announced today that they will sponsor a free walking tour of the Hunters Point Avenue Bridge in Long Island City on Saturday, December 11, 2010 at 11 a.m. to celebrate its 100th birthday. 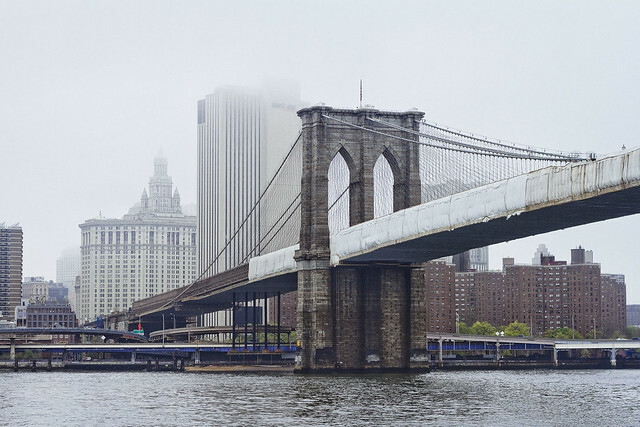 “It’s important to celebrate these milestones as a way to show how much we rely on all these crossings in our day-to-day lives,” said NYC BCC President Sam Schwartz. Your tour guides for this centennial event will be Newtown Creek Alliance and Working Harbor Committee’s Bernard Ente, and a certain humble narrator will be assisting him in meager ways. This location is awfully close to both legendary Greenpoint and to the heart of Long Island City, and quite close to Manhattan via subway. Here’s a google map with the location of the Bridge, and the meet-up point at 21st street and Hunters Point Avenue is called out. 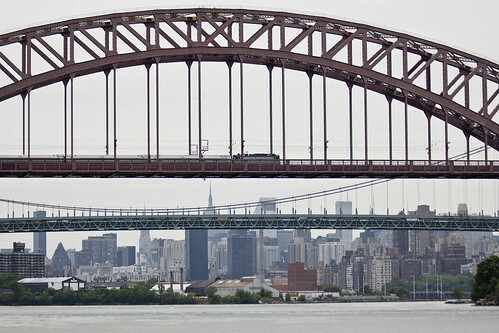 The original Hunters Point Avenue Bridge dates back to 1874 when the bridge was a wooden structure. From 1874 to 1907 an iron bridge was in place before being replaced in 1910 by a double-leaf bascule bridge. It was again rebuilt in the early 1980s as a single-leaf bascule bridge. Bascule bridges are designed with a counterweight that balances the span as it swings upward (a single leaf lifts up from one end while a double leaf lifts up from both sides in the middle of the span). 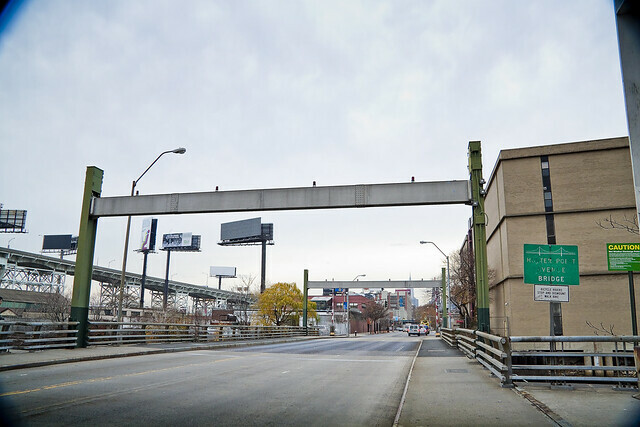 The bridge is located between 27th and 30th streets in Long Island City and is situated four blocks east of the Borden Avenue Bridge. The span is 21.8 meters long and has two lanes, one in each direction. 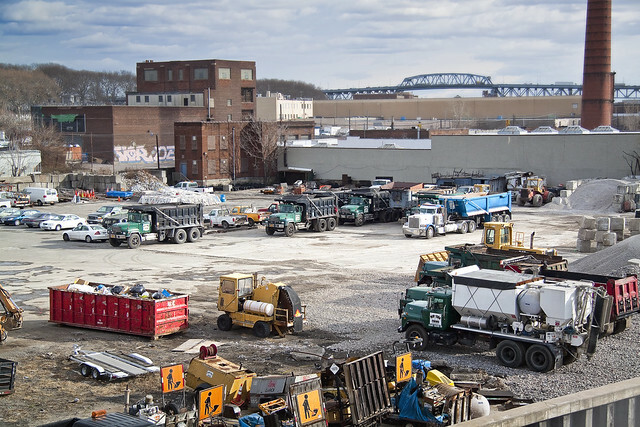 It has experienced higher traffic volumes over the last year and a half while the Borden Avenue Bridge has been closed for construction in this heavily industrialized area. Spectacular views of Dutch Kills, as well as knowledgeable and unbiased narration, can be had for the price of attendance alone. 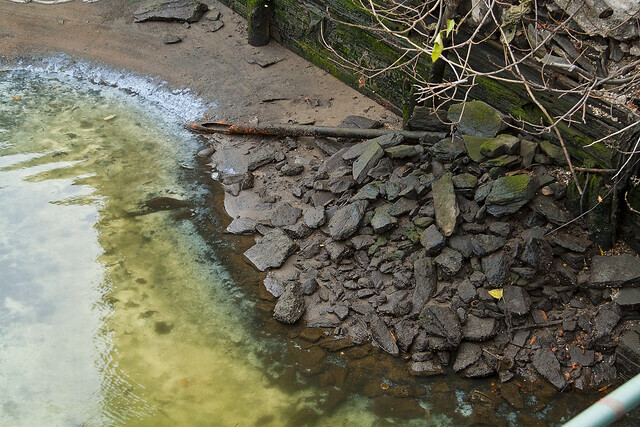 Attendees are advised to bring cameras, as this is a particularly photogenic section of the Newtown Creek watershed. 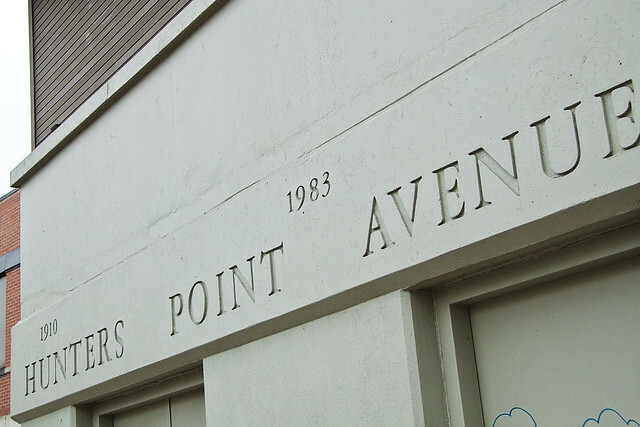 The meeting point for the tour will be at Hunters Point Avenue at 21st Street outside the 7 train station. If you would like to participate, please email tour guide Bernie Ente at info@entephoto.com. 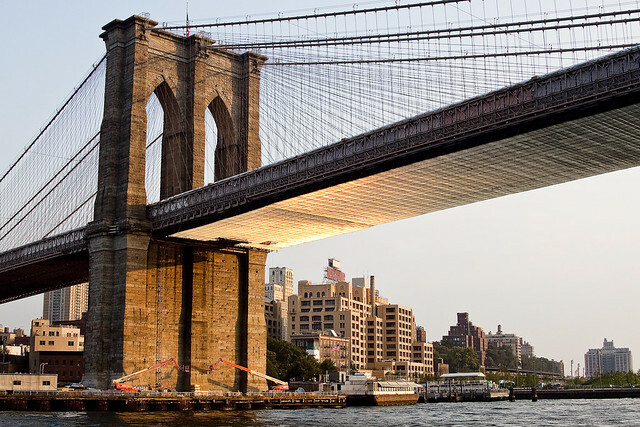 The NYC Bridge Centennial Commission is a 501 c 3 non-profit comprised of public and privateorganizations to commemorate the centennials of several NYC bridges and raise infrastructure awareness. 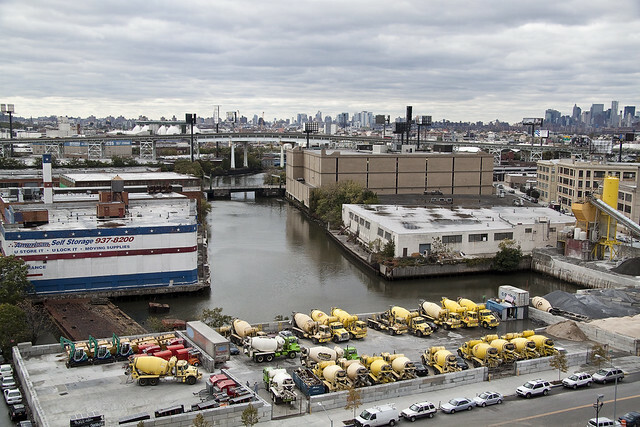 The Newtown Creek Alliance represents interests of community residents and local businesses who arededicated to restoring community health and vibrant water dependent commerce along Newtown Creek. 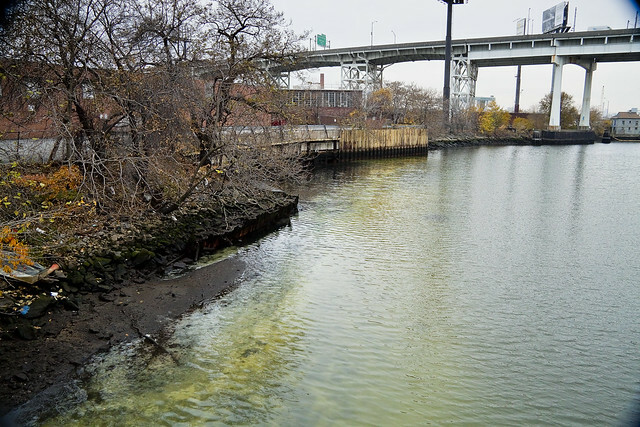 Dutch Kills is a familiar sight to regular readers of this, your Newtown Pentacle, but must be experienced first hand by all interested in the story of the Newtown Creek. This will not be a rigorous walking experience- sneakers or other comfortable shoes should be sufficient as we won’t be leaving the sidewalk- but if icy conditions occur- use good judgement. Undoubtedly, it will be cold, and the event will be happening rain, shine, or snow- so gauge your outerwear according to forecasted weather conditions. For those interested in further discussion with other antiquarians and enthusiasts, we are planning an after event visit to a local diner for coffee, luncheon, and conversation. Hunters Point Avenue is a two-lane local City street in Queens. Hunters Point Avenue is oriented east-west and extends from 21st Street to the Long Island Expressway/Brooklyn Queens Expressway interchange in Queens. The avenue is parallel to and approximately one block south of the Long Island Expressway. The Hunters Point Bridge over Dutch Kills is situated between 27th Street and 30th Street in the Long Island City section of Queens, and is four blocks upstream of the Borden Avenue Bridge. It is a bascule bridge with a span of 21.8m. The general appearance of the bridge has been significantly changed since it was first opened in 1910. The bridge provides a channel with a horizontal clearance of 18.3m and a vertical clearance, in the closed position, of 2.4m at MHW and 4.0m at MLW. The bridge structure carries a two-lane, two-way vehicular roadway with sidewalks on either side. The roadway width is 11.0m, while the sidewalks are 1.8m wide. The width of the approach roadways vary from the width of the bridge roadway. The west approach and east approach roadways are 13.4m and 9.1m, respectively. The first bridge at this site, a wooden structure, was replaced by an iron bridge in 1874. That bridge was permanently closed in 1907 due to movement of the west abutment, which prevented the draw from closing. It was replaced in 1910 by a double-leaf bascule bridge, designed by the Scherzer Rolling Lift Bridge Company. The bridge was rebuilt in the early 1980′s as a single-leaf bascule, incorporating the foundations of the previous bridge. 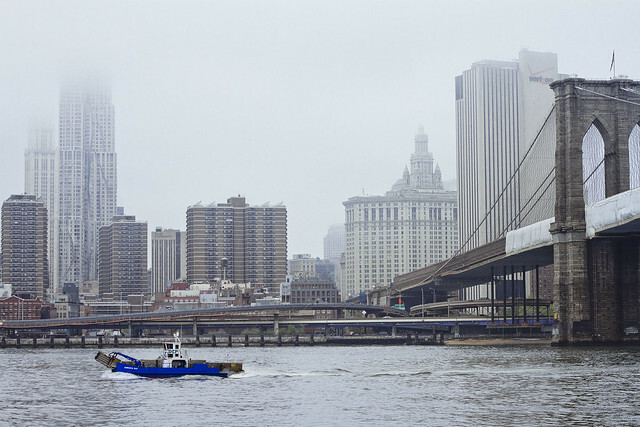 a photo in the same series as the one below was recently exhibited here- in the “from some point in space” posting about Dutch Kills and the Hunters Point Avenue Bridge. While doing supplemental research about the place, I came across the following shot embedded in a scanned “google book”, and the two images form an interesting parallel. The BW shot, you see, is from 1921. Coincidence abounds, but I believe my forebear was shooting from a similar if not same vantage as I would be at some four score and nine years or 24,855 days later. 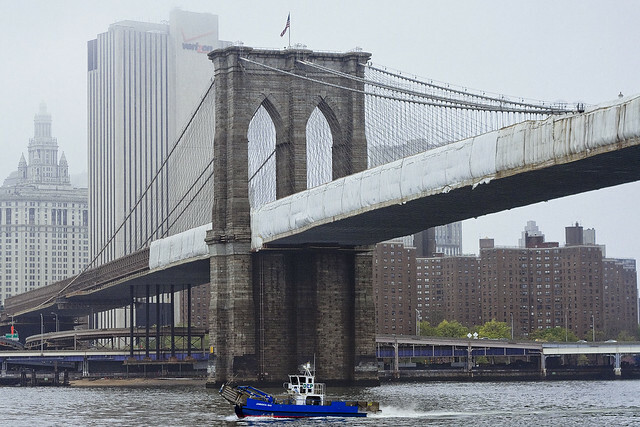 Luckily, there seems to be some effort underway to paint the Brooklyn Bridge. A sheathing of reflective metal scaffolding recently heralded a fortuitous confluence of solar azimuth and camera vantage point as evidenced above. Luck, pure luck. Check out the larger sizes at flickr by clicking the image (as always). An FDNY fireboat shooting Red White and Blue water in between the Triborough and HellGate Bridges, followed by a cool tugboat, and then a fireworks display framed against the latter bridge. Happy 4th of July! Throughout the centuries the stunning natural beauty of this location has attracted visitors and settlers. Before the arrival of European colonists, a trail passed by the site, and an Indian village flourished at Pot Cove. Local inhabitants grew maize on the shores, fished in Hell Gate, and drew water from Linden Brook, a small stream that still flows under Astoria Park South. In the mid-1600s the Dutch parceled out this land to various owners, including William Hallet whose grant embraced hundreds of acres. During the American Revolution, several British and Hessian regiments were stationed in the area. On November 25, 1780 the frigate Hussar and its five-million-dollar cargo sank to the bottom of Hell Gate, where despite some removal of cannons, the treasure still remains. I’ve become pretty familiar with NY Harbor in the last year, and can identify some of the common types of ships that cross its waters. Every now and then, however, a mysterious craft- an unidentified floating object or UFO if you will- crosses in front of me. Proceeding south, this catamaran (actually a trimaran) was nearly devoid of markings- which is remarkable in itself- and moving at a tremendous clip. Its “colorway” and hull shape instantly said “military” to me, but I could not recognize its specie. The first trimarans were built by indigenous Polynesians almost 4,000 years ago, and much of the current terminology is inherited from them. Multihull sailboats (catamarans and trimarans) gained favor during the 1960s and 1970s. Modern recreational trimarans are rooted in the same homebuilt tradition as other multihulls but there are also a number of production models on the market. A number of trimarans in the 19–36-foot lengths (5.8–11 m) have been designed over the last 30 years to be accommodated on a road trailer. These include the original Farrier – Corsair folding trimarans – and original John Westell swing-wing folding trimaran (using the same folding system later adopted also on Quorning Dragonfly) and like trimarans. Many sailboat designers have also designed demountable trimarans that are able to be trailered (like the SeaCart 30 by Oceanlake Marine). The trimaran design is also becoming more widespread as a passenger ferry. In 2005 the 127-metre trimaran (417 ft) Benchijigua Express was delivered by Austal to Spanish ferry operator Fred. Olsen, S.A. for service in the Canary Islands. Capable of carrying 1,280 passengers and 340 cars, or equivalents, at speeds up to 40 knots, this boat was the longest aluminum ship in the world at the time of delivery. 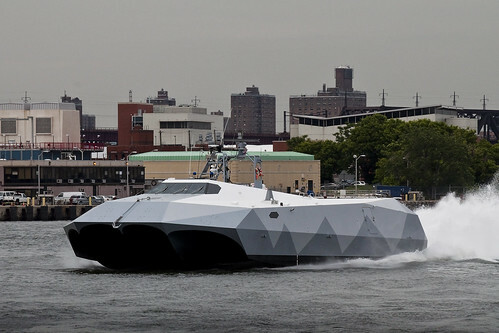 The trimaran concept has also been considered for modern warships. The RV Triton was commissioned by British defence contractor QinetiQ in 2000. In October 2005, the United States Navy commissioned for evaluation the construction of a General Dynamics Littoral Combat Ship (LCS) trimaran designed and built by Austal. Evocative, as on one hand it resembled a radar dodging stealth aircraft for the odd angles and aerodynamic shape, on the other it suggested a modern combat tank with its armor designed to deflect rather than defeat ballistic weapons. The ship, nevertheless, was kicking up a huge wake and was shooting water behind it- some 10-20 feet high- as it rocketed down the East River. The littoral zone refers to that part of a sea, lake or river that is close to the shore. In coastal environments the littoral zone extends from the high water mark, which is rarely inundated, to shoreline areas that are permanently submerged. It always includes this intertidal zone and is often used to mean the same as the intertidal zone. However, the meaning of “littoral zone” can extend well beyond the intertidal zone. There is no single definition. What is regarded as the full extent of the littoral zone, and the way the littoral zone is divided into subregions, varies in different contexts (lakes and rivers have their own definitions). The use of the term also varies from one part of the world to another, and between different disciplines. For example, military commanders speak of the littoral in ways that are quite different from marine biologists. The adjacency of water gives a number of distinctive characteristics to littoral regions. The erosive power of water results in particular types of landforms, such as sand dunes, and estuaries. The natural movement of the littoral along the coast is called the littoral drift. Biologically, the ready availability of water enables a greater variety of plant and animal life, and the additional local humidity due to evaporation usually creates a microclimate supporting unique types of organisms. The “colorway” and camouflage of the craft suggested that the futurists of Britain still have modern adherents, long after the last of the “dazzle ships” were launched. For those of you not in the know, the Dazzle Ships were an experiment in “breaking up the shape” of large combat vessels against the horizon, an attempt to reduce the visual profile of capital ships and reduce the ability of submariners to target vital areas of said ships. Dazzle works best at distance, which is what modern naval combat is all about. At first glance Dazzle seems unlikely camouflage, drawing attention to the ship rather than hiding it, but this technique was developed after the Allied Navies were unable to develop effective means to disguise ships in all weather. Dazzle did not conceal the ship but made it difficult for the enemy to estimate its type, size, speed and heading. The idea was to disrupt the visual rangefinders used for naval artillery. Its purpose was confusion rather than concealment. An observer would find it difficult to know exactly whether the stern or the bow is in view; and it would be equally difficult to estimate whether the observed vessel is moving towards or away from the observer’s position. Rangefinders were based on the co-incidence principle with an optical mechanism, operated by a human to compute the range. The operator adjusted the mechanism until two half-images of the target lined up in a complete picture. Dazzle was intended to make that hard because clashing patterns looked abnormal even when the two halves were aligned. This became more important when submarine periscopes included similar rangefinders. As an additional feature, the dazzle pattern usually included a false bow wave to make estimation of the ship’s speed difficult. As mentioned, my computer was down for the holiday weekend, but Our Lady of the Pentacle allowed me to use her laptop and I managed to get a few of these images out to that clandestine and anonymous network of maritime enthusiasts and quasi governmental experts who advise, comment, or offer corrections to your Newtown Pentacle. Credit for identifying this craft goes out to them, and I wish that they would allow me to sing praise publicly, but certain conflicts of interest or oaths of secrecy demand that they must always be referred to as “anonymous sources”. In this case, the ultimate sources will be referred to as Daidalos and Icaros (hey, it is Astoria Park). It is in images, not in texts that Daedalus is seen with wings; many Greek myths appear to have been invented to make sense of known but inexplicable images. The most familiar literary telling explaining Daedalus’ wings is a late one, that of Ovid: in his Metamorphoses (VIII:183-235) Daedalus was shut up in a tower to prevent his knowledge of his Labyrinth from spreading to the public. He could not leave Crete by sea, as the king kept strict watch on all vessels, permitting none to sail without being carefully searched. Since Minos controlled the land and sea routes, Daedalus set to work to fabricate wings for himself and his young son Icarus. He tied feathers together, from smallest to largest so as to form an increasing surface. The larger ones he secured with thread and the smaller with wax, and gave the whole a gentle curvature like the wings of a bird. When the work was done, the artist, waving his wings, found himself buoyed upward and hung suspended, poising himself on the beaten air. He next equipped his son in the same manner, and taught him how to fly. When both were prepared for flight, Daedalus warned Icarus not to fly too high, because the heat of the sun would melt the wax, nor too low, because the sea foam would soak the feathers. Daidalos was actually stumped when the photos arrived, and neither of us could make any sense of the only marking- a string of tiny numbers on the hull- of this unidentified floating object. High flying, Icaros received the shots from the latter, and contacted high ranking members of a certain governmental entity. This entity- let’s just say that they have lots of boats and planes, and boats that are airports, and boats that carry nuclear missiles and stay underwater for months at a time, and a lot of the people who work for it wear white dress uniforms– claimed the ship as theirs! From the time of its inception, the military played a decisive role in the history of the United States. A sense of national unity and identity was forged out of the victorious Barbary Wars, as well as the War of 1812. Even so, the Founders were suspicious of a permanent military force and not until the outbreak of World War II did a large standing army become officially established. The National Security Act of 1947, adopted following World War II and during the onset of the Cold War, created the modern U.S. military framework; the Act merged previously Cabinet-level Department of War and the Department of the Navy into the National Military Establishment (renamed the Department of Defense in 1949), headed by the Secretary of Defense; and created the Department of the Air Force and National Security Council. The U.S. military is one of the largest militaries in terms of number of personnel. It draws its manpower from a large pool of volunteers; although conscription has been used in the past in various times of both war and peace, it has not been used since 1972. As of 2010, the United States spends about $692 billion annually to fund its military forces, constituting approximately 43 percent of world military expenditures. The U.S. armed forces as a whole possess large quantities of advanced and powerful equipment, which gives them significant capabilities in both defense and power projection. 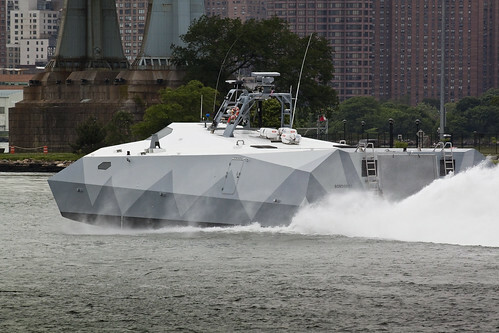 What you have just seen, lords and ladies, shooting down the East River at high speed was described as a (JHSV) Joint High Speed Vessel. A JHSV can comfortably carry 300 fully armed MARINES, or up to 600 in a pinch. Alternatively, it can move multiple main battle tanks- the astounding M1 Abrams. Just so you understand, 600 is near the low end of Battalion strength, and 600 U.S. Marines could probably claim a beachhead in Hell itself if they were asked to. It also has a landing pad for a helicoptor. This ship is huge… but a helicoptor pad? The JHSV program is procuring high-speed transport vessels for the Army and the Navy. These vessels will be used for fast intra-theater transportation of troops, military vehicles and equipment. The JHSV program merges the previous Army Theater Support Vessel (TSV) and the Navy High Speed Connector (HSC), taking advantage of the inherent commonality between the two programs. JHSV will be capable of transporting 600 short tons 1,200 nautical miles at an average speed of 35 knots. The ships will be capable of operating in shallow-draft ports and waterways, interfacing with roll-on/roll-off discharge facilities, and on/off-loading a combat-loaded Abrams Main Battle Tank (M1A2). Other joint requirements include an aviation flight deck to support day and night air vehicle launch and recovery operations. 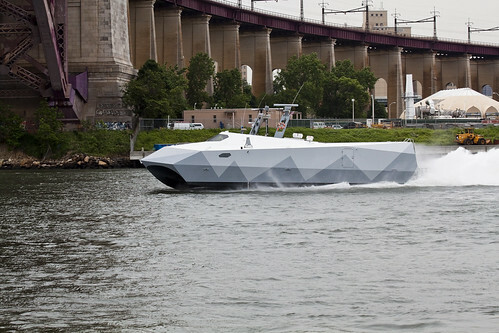 JHSV is a commercial-design, non-combatant transport vessel, and does not require the development of any new technology. JHSV is being built to American Bureau of Shipping (ABS) High Speed Naval Craft Guide. Systems onboard will be based on commercial ABS steel vessel rules. As such, it does not require the survivability and ability to sustain damage like the LCS. It has no combat system capability and no ability to support or use LCS mission modules. It will leverage non-developmental or commercial technology that is modified to suit military applications. Select military features include Aviation; Command, Control, Communications, Computers, and (Military) Intelligence; and Firefighting for the Mission Bay. NVR does not apply to any part of JHSV. As a non-combatant sealift ship, the Navy variant of JHSV will be crewed by civilian mariners, either employed by or under contract to the Navy’s Military Sealift Command. U.S. Army vessels will be crewed by Army craft masters. Both versions will require a crew of approximately 22-40 people, but will have airline style seating for more than 300 embarked forces and fixed berthing for approximately 100 more. Primary Function: The JHSV Program will provide high speed, shallow draft transportation capability to support the intra-theater maneuver of personnel, supplies and equipment for the U. S. Navy, Marine Corps, and Army. 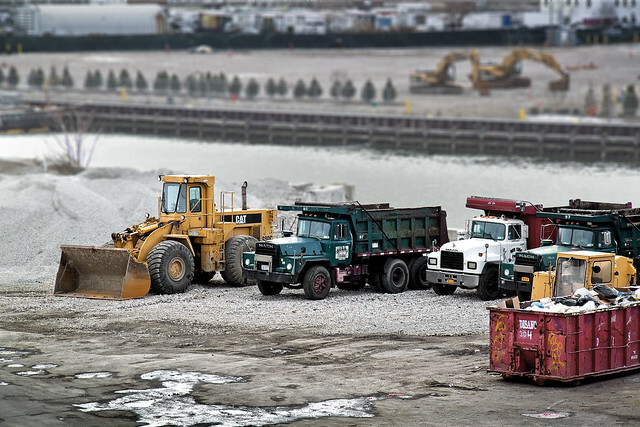 Homeport: No homeport – construction has yet to begin. However… This is not a JHSV!!! This here is the M80 Stiletto. Check out this video at youtube which explains the Stiletto’s potential in great detail, and supplies 3D animation for operational scenarios. With the formal roll-out of the 88-foot Stiletto stealth ship and its cutting-edge “M-Hull” wave-damping design, that legacy takes another step forward. 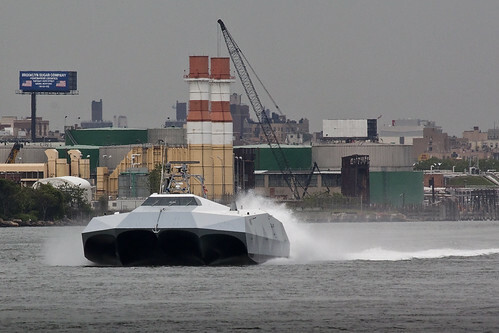 The Stiletto is part of Project WolfPac, which aims to test new concepts of shallow-water and riverine warfare organized around swarms of smaller, affordable ships linked by communications. The Stiletto can slip into shallow waters, launching inflatable boats and even UAVs while serving as a communications hub via its “electronic keel.” Best of all, the M-Hull significantly reduces the pounding its occupants take from waves – poundings that often result in back injuries that cut careers short, or leave sailors with lingering disabilities in later life. 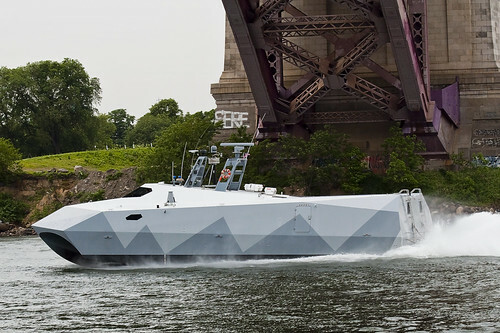 The 88-foot (27 m) long vessel has a notable hull design, an M-shaped hull that provides a stable yet fast platform for mounting electronic surveillance equipment or weapons, or for conducting special operations. The hull design does not require foils or lifting devices to achieve a smooth ride at high speeds in rough conditions. Its shallow draft means the M80 Stiletto can operate in littoral and riverine environments and potentially allows for beach landings. The M80 Stiletto is equipped with four Caterpillar, Inc. C32 1232 kW (1652 HP) engines yielding a top speed in excess of 50 knots (90 km/h) and a range of 500 nautical miles (900 km) when fully loaded. It can be outfitted with jet drives for shallow water operations and beaching. It has a topside flight deck for launching and retrieving UAVs and a rear ramp that can launch and recover an 11-meter rigid-hull inflatable boat (RIB) or Autonomous Underwater Vehicle (AUV). It weighs 45 tons unloaded, light enough that it can be hoisted onto a cargo ship, while still able to carry up to 20 tons of cargo in the 1,996 square feet (200 m2) of usable interior space. The ship is 88.6 feet (27.0 m) in length, with a width of 40 feet (12 m) and a height of 18.5 feet (5.6 m), yet has a draft of only 2.5 feet (0.8 m).